One of the most obvious ways to increase your WordPress theme sales is to find more sales channels. And multi-vendor marketplaces like ThemeForest alternatives are one of the most effective places for that. Why? If you sell your theme/themes on your website alone, how many chances it’ll get in front of thousands of prospects? Far less than with the audience of established marketplaces. If you don’t have a dedicated website for your theme (no way, really? ), again, a marketplace can fulfill this function pretty well. ThemeForest was undoubtedly a launchpad for many successful businesses, including WordPress themes and plugins developers. However, gaining attention there now is not a question of your theme quality and promotion, but a matter of time. This marketplace is painfully overcrowded with themes providers, so it may take years for a new theme to generate good income. So, the competition there is a way harder. Scared? No worries. It’s great if your theme was accepted on ThemeForest, this means you proved your theme is of good code quality and design, but the rest of promotion work is more exhausted. In case the theme was not accepted, this is not the end. In both scenarios, don’t stop exploring new ways and strategies of promoting your theme. Fortunately, there are some good marketplace alternatives – some give you more, some less space to sell themes, plugins and other digital products. It will probably take even more time to get the first purchase, but it’s better than nothing. Moreover, on smaller marketplaces you have more chances of theme submission approval, to make it more popular and be more motivated in its promotion. It’s like with Google AdSense – many bloggers want to generate income with this market leader, but failing to even get approval, they manage to monetize their blog pretty well with AdSense alternatives. Also, we are not going to tell about WordPress.org in this post assuming you know about its possibilities (and a marketplace is a bit of misnomer for the .org repository, actually). 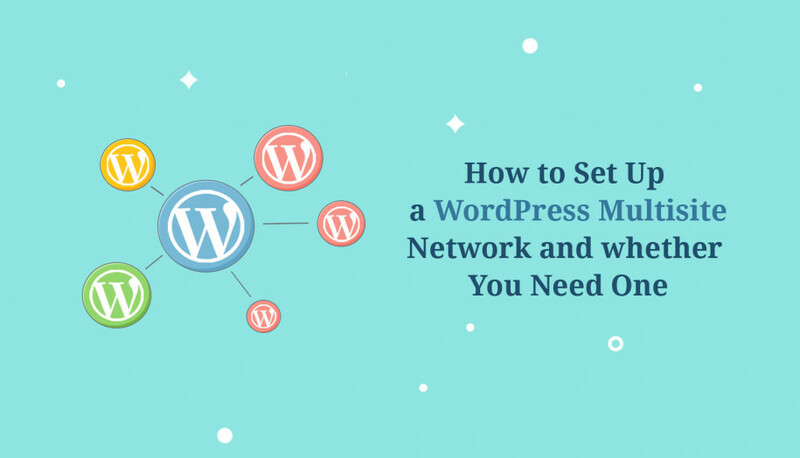 However, if your theme is distributed under freemium pricing model, wordpress.org should be the first in your list! 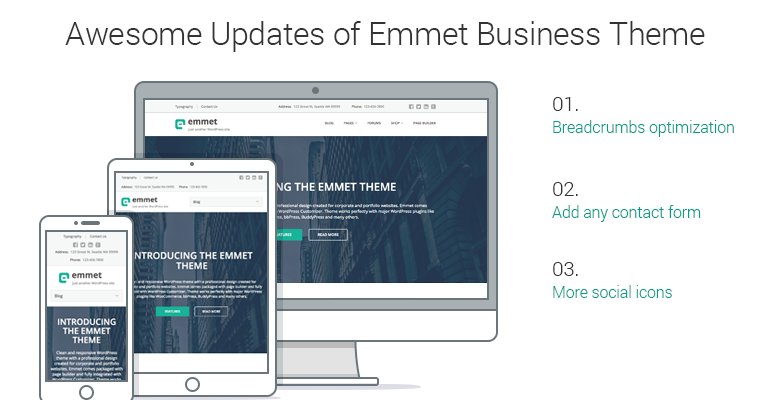 You should also know that there are even several great tools like Freemius Revenues helping you convert free theme users into buyers with less efforts. So, let’s take a closer look at some top ThemeForest alternatives where you can sell your WordPress products. I’ve also included data with estimated monthly visits (taken from SimilarWeb data platform) for you to see which marketplaces are currently popular among sellers and users. Sure, you’ve heard about it. But probably you are not aware of all the benefits of this marketplace. This is actually the second place people turn to after ThemeForest, no matter whether their theme was accepted or rejected by the latter. It has a solid base of buyers and sellers clientele (around 3 million members in total). From each non-exclusive sold theme you get your 70% share – quite fair in comparison with many other smaller marketplaces. Creative Market also offers lots of tools to keep up with customers, monitor statistics, and easily respond to support tickets. One of the best things sellers love about Creative Market is that you don’t have to wait for any approval. Upload your theme and it will go live automatically, so you can start promoting it at that same day. Speaking from our own experience, WordPress themes here are not sold that quickly, but regularly, so it definitely worth giving it a whirl. 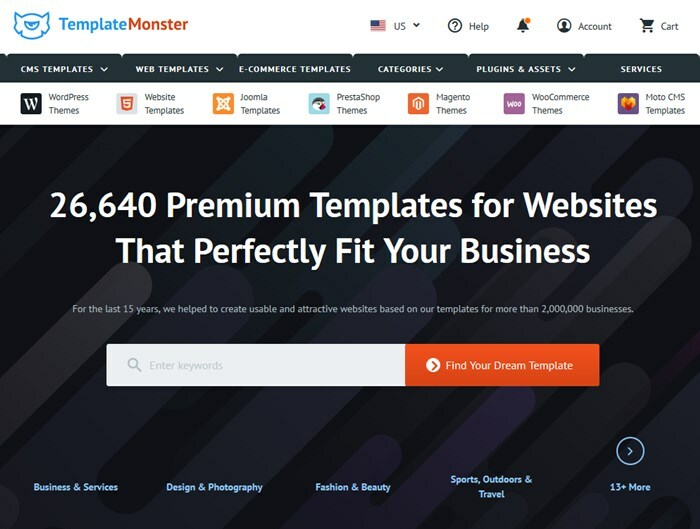 Template Monster is one of the most popular marketplaces of digital products, one the main competitors of ThemeForest. Earlier vendors did not consider it as a place to sell, because TemplateMonster was selling only their own templates. Now, this giant is working in an absolutely different format: vendors can submit their products and receive a pretty good commission from sales. In order for your WordPress theme to be submitted on TemplateMonster, it should meet design and technical requirements. The procedure is quite complicated – you’ll need to sign a vendor agreement and follow a lot of their rule. Vendors of non-exclusive themes receive 40% from the themes’ cost. Not that much, agree? But imagine the clientele base of the Template Monster giant and it gets clear that it’s worth a try. The commission of exclusive themes will depend on the sales volume. You might also need a step-by-step guide of how to become a vendor on TemplateMonster marketplace. 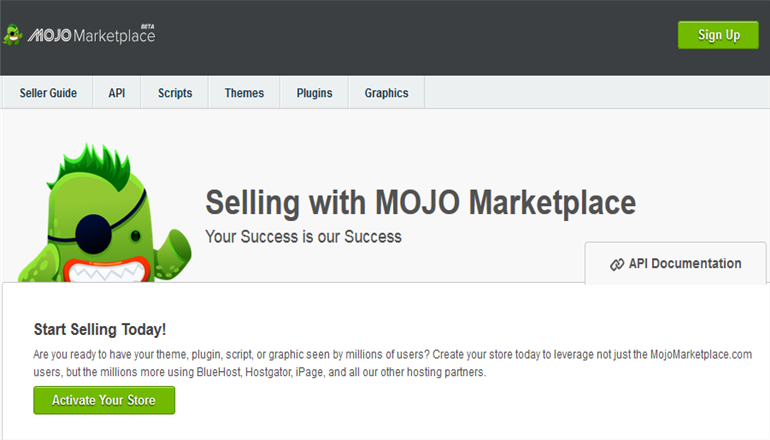 Mojo is another popular marketplace where you can get money from selling your WordPress theme. For exclusive authors they offer 50% commission of sales revenue. Starting with 201 sales, your commission rate is increasing up to 55% and so forth with an ability to reach 70% commission after 2,001 sales threshold is passed. Non-exclusive authors will get their static 50% commission of their sales revenue. You’ll be able to get your money through PayPal once there is at least $50 on your account. Make sure to check out all guides for theme sellers – your theme will need to go through the review process before appearing on the marketplace. Make sure to polish your theme well before submitting, because these guys accept only very quality ones. Inkthemes is one of the biggest and most visited marketplaces, where you can sell your WordPress themes. Additionally, here you can sell plugins, graphics, etc. They claim that they have a 50,000+ users base, which is a huge number. As for digits, you’ll get 50% of each sale (not necessarily exclusive theme) – not bad for a starting point at such a popular platform. General requirements to theme design, cross-browser compatibility, markup, styles and scripts. 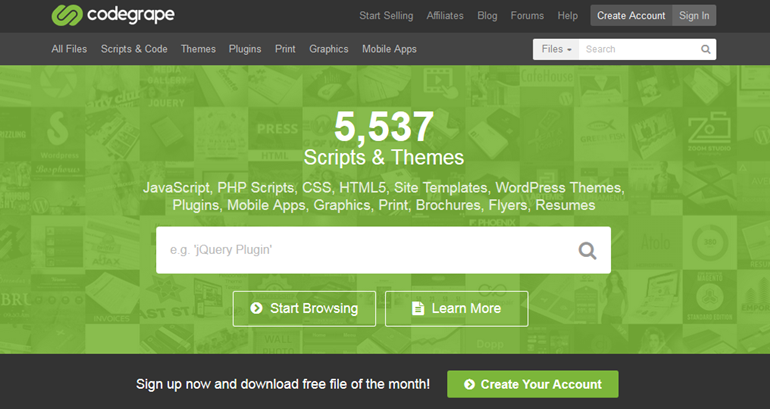 Up-to-date theme featured image and screenshots. Terms of licensing and attribution. Before submitting, stop for a second and think how your theme can be improved – whether it’s functionality or design. By the way, if you’ve been looking for implementing more user-friendly tools to ease the editing experience of your clients, probably you’ll be interested in the frontend editor we are polishing for 4 years already. Codester is a young but promising platform for selling and buying digital products, which already has its audience. 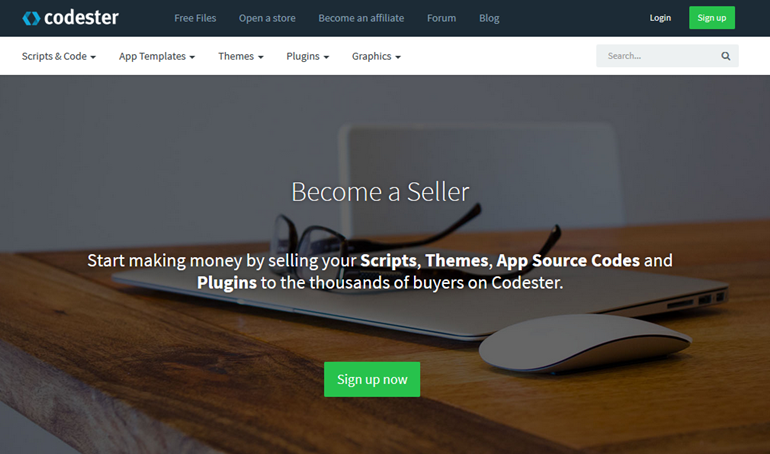 Additionally, this marketplace allows you to sell scripts, plugins, and graphics. One of the most pleasant things this marketplace offers to WordPress developers is 70% commission rate, without restrictions. Also, it’s not necessary for your theme to be exclusive, so you may submit it even if you sell it somewhere else. The review process usually takes up to 2 days. The marketplace has a very intuitive, properly categorized search interface for users, so “your theme” won’t stay unnoticed. 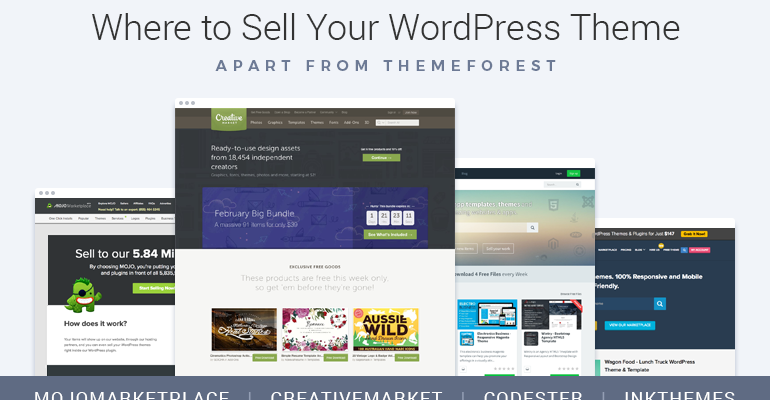 Here you can sell your theme with a regular or extended license. Not all products here are supplied with demo, so make sure you stand out from the crowd and add a demo link to your WordPress theme. To create an attractive demo and run trials for your WordPress themes, you don’t have to build it all from scratch, MotoPress Demo Builder plugin is a ready-made-solution for this purpose. Make sure to check it out (by the way, it’s now available at extremely low price in a bunch with all other MotoPress plugins and themes for WordPress – check out Membership for details). Apart from WordPress themes, on this marketplace there is much more space for selling various kinds of stuff like scripts, mobile apps, graphics, prints, brochures, etc. The interface is pretty much inspired by ThemeForest making the site very user-friendly and familiar for buyers. 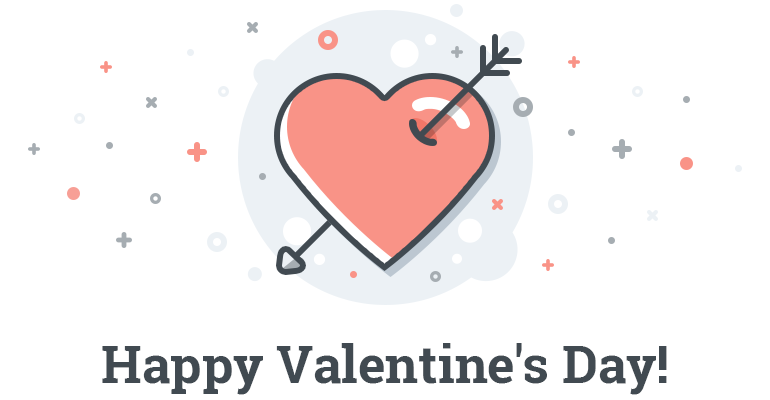 To send your theme submission, you should start with creating a user account and upgrading it to Author, which gives you an opportunity to earn 60% on each sale and set your own prices for your themes. You’ll be also provided with additional tools to help you track statistics and get closer to your customers. Before submitting, make sure to read all legal information on membership agreement. The approval process is quite fast, so more likely you won’t need to wait too long. 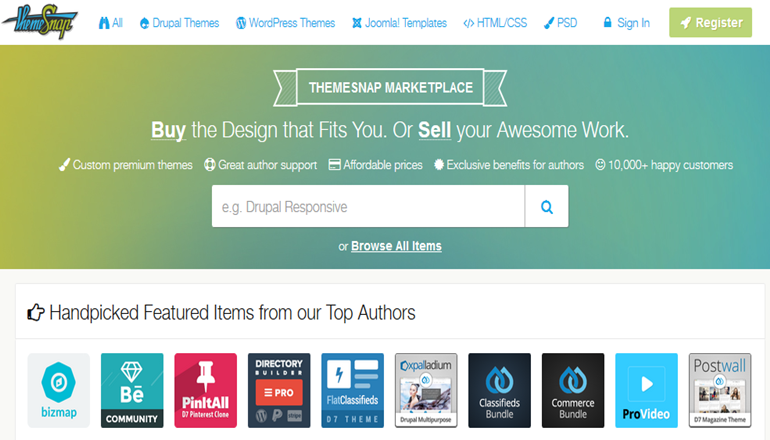 ThemeSnap is another popular platform for selling various digital products. A pleasant thing, they offer an attractive payment rates (55% on each sale) with an ability to reach up to 75% payout level over time (PayPal support). Around ten thousand customers are now buying products at ThemeSnap. They also don’t require your theme to be exclusive in order to be sold on this marketplace. Selling your WordPress theme on ThemeSnap, you are provided with some extra goodies: you can set monthly subscriptions for customers, offer various discounts, co-work with other developers and designers. Moreover, guys from Themesnap promise “instant submission” to make you wait for the submission approval not more than a day. Make sure to check the author’s guideline before submitting your theme. Gridgum is a small but developing marketplace with more than four thousand members. If you decide to sell your themes here, you’ll be offered a fixed commission of 60% for exclusive themes and 40% for non exclusive themes. They also offer a great policy of multiplying your revenue through offering additional Installation service to customers. One more good point about this marketplace is that they put lots of efforts in themes promotion, so good fortune can also come your way without additional costs. 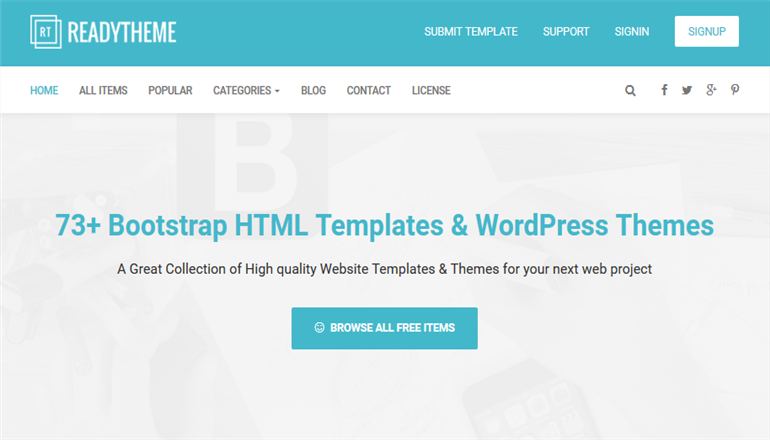 Though this marketplace makes a special emphasis on “responsive theme only” approach, their themes are not limited to Bootstrap. You must be able to receive money via PayPal to be a seller on Gridgum. Wpeden is quite popular marketplace among developers. The approval process is rather fast and the submission policy is less complicated than with Codegrape, for example. 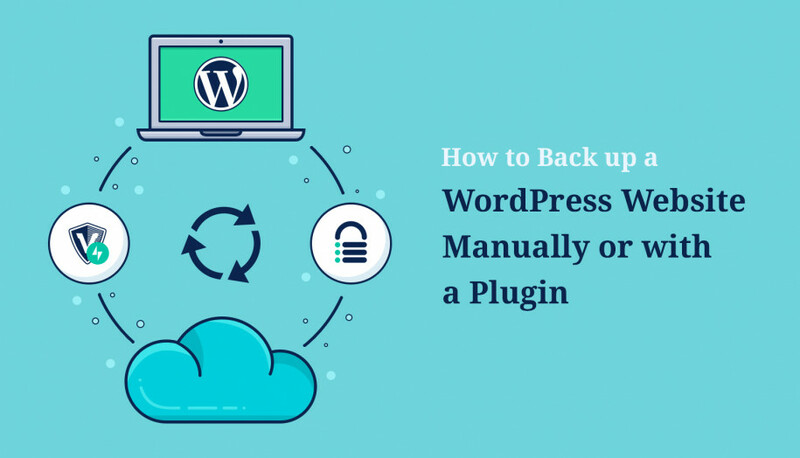 As usually, you must submit themes written totally by you and get prior permissions if there are any code parts or graphics created by other authors. If you decide to submit your WordPress theme (or even plugin) to this marketplace, take care of all documentation and guides for users beforehand. As for the payment, all non-exclusive themes will be cut 50%. They support PayPal and Skrill transfers. ReadyTheme is relatively small platform for selling your WordPress stuff, so a “marketplace” is a bit misnomer in this case, but it shows a lot of promise: the numbers show more than forty thousand total downloads and 2754 community members so far. The main submission requirement is that your theme should be be Bootstrap 3 or newer based. If you are already interested, take a look at 15 main points of the submission guideline which gives you a clear understanding of what kind of cooperation they are looking for. Unfortunately, they don’t specify the payments rates, so if this offer looks interesting for you, contact their support team. The more places to showcase your theme, the easier theme promotion is, the more chances to increase your sales. One quick advice – try to write a unique description of the same theme uploaded to different marketplaces, put some efforts in guest blogging with a link to your theme on different marketplaces, namely, go an extra mile. Just don’t stop exploring new channels and be defensive to the bitter end – a bit of determination can get you a really long way. Do you know any effective marketplace I forgot to mention here? Do you have any experience of selling your theme on the marketplaces other than ThemeForest? Share your priceless experience. 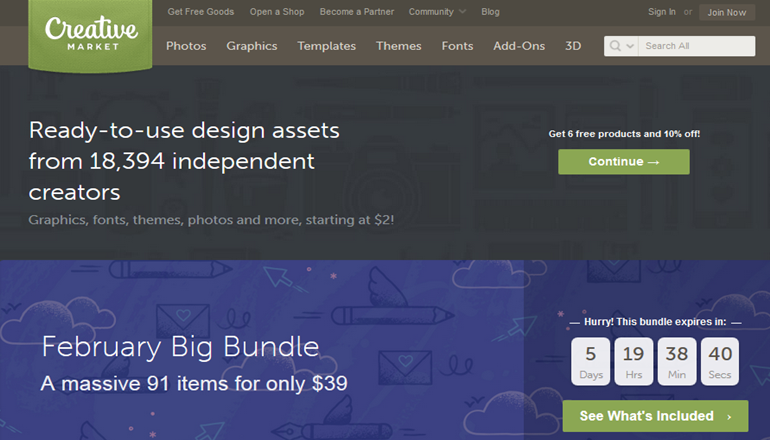 Hi we would like to add https://www.x5tuts.com to the list originally the site was setup for website x5 templates but has now grown to include word press, joomla, graphics and more they also give the sellers 85% commission on all sales. Hey Jamie! Looks good, keep up the good work.